Bill Darlison: Roads for Travelling Souls: Was Jesus a Mason? Laid Jesus Christ in his grave. It suits the sentiments of Woody’s song to suggest that Jesus was a carpenter, because it seems to be one of the most honourable of trades. Not too fancy, not too lowly. Had he been said to belong to the professional class – a lawyer, a politician, or an academic – we might have been inclined to suspect his motives or his integrity. These are people who never get their hands dirty, but who live quite well off the physical labours of others. Not all trades would do either. Even today, some trades enjoy higher status than others. Car mechanics and plumbers may soil their hands, but there is something quite disreputable about them in the popular mind: they have the expertise to baffle us and to swindle us. That sharp intake of breath through the teeth when the plumber first looks at the job and tells you that it can’t be done cheaply; that extortionate call out fee; the wink-wink nudge-nudge as he offers you a discount for cash payment. These are the tradesmen we need in a hurry, called to sort out an emergency, and while we are always glad when they appear, we’d very much rather that we didn’t have to call them out at all. 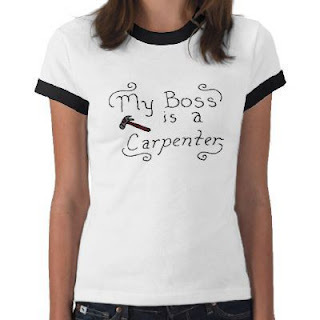 But a carpenter is different. There are few ‘emergency’ carpentry jobs. We don’t need an emergency table or an emergency chest of drawers; we never have to call out a carpenter in the middle of the night. Carpenters can’t really capitalise upon our misfortunes. We associate a kind of gentle, slow creativity with carpentry. It is, we think, a profession for the honourable, the trustworthy, and the honest. So, it’s perfect for our sentimentalised portrait of Jesus. Mel Gibson made much of it in his film The Passion of the Christ. 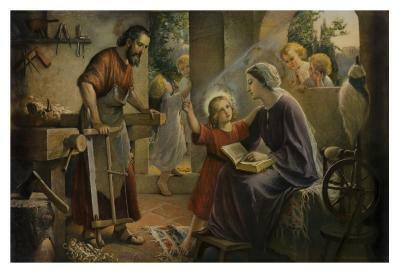 Jesus is shown in flashback, making some item of furniture or other in his workshop, his mother looking on proudly. And there can be no doubt that somewhere in the world there is a table or a chair which, its owners claim, was fashioned by the very hand of Jesus. One reason that I think builder is a better translation than carpenter is because the Gospels contain absolutely no reference to carpentry but plenty of references to building. Nowhere does Jesus use an image drawn from furniture making. In his teaching on marriage, for example, he doesn’t say that a man and women should be joined together as firmly as a mortice and tenon joint. He doesn’t say that we should smooth away our vices like a plane smooths wood; he doesn’t say that God grants rest to the soul like a well-made bed grants rest to the body. But he does say that ‘the stone which the builders rejected has become the cornerstone’; that one who pays no heed to Jesus’ words is like a man who builds his house upon the sand; that his community will be built upon a rock; that no stone will be left upon another when the Temple is destroyed. These are the kind of metaphors we would expect in a story about a man who was once engaged in the building trade. Curiously, Jesus as a mason, or a builder, helps us to understand the puzzling word that Mary Magdalene uses when greeting the resurrected Jesus. ‘Rabboni,’ she exclaims, and this is generally left untranslated or explained as an Aramaic idiom meaning ‘my rabbi, or my teacher’. But the word could just as easily come from the Hebrew where it means, ‘my master builder’. I remember once when I was in Paris, I visited Notre Dame Cathedral. There I saw on the lower levels gargoyles representing the different vices of man. As one went up higher the gargoyles seemed to become more abstract – to represent pure hatred or greed or lust. High above them soared the spires, seeming at last to have rid themselves of all vices except one. For leaping out from the great heights were the cold serpents of pride. So, the gargoyles tell us, the last vice to leave us is pride, the last snake we tumble down in the game of spiritual snakes-and-ladders is the snake of pride, and it comes at number ninety-nine on the board, just as we think we are about to arrive safely at the winning post. 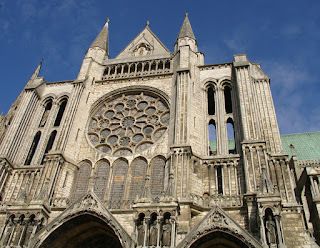 Each of the great cathedrals – but particularly Notre Dame and Chartres – would merit a lifetime of study, so rich is the symbolism deliberately incorporated into these wonderful buildings by stonemasons, inheritors of an ancient wisdom which they present to us in timeless images to delight our imagination, images which transcend the theological divisions generated by a purely verbal and rational approach to matters of the spirit. ‘The Giants’ Causeway,’ said Dr. Johnson, ‘is worth seeing, but it’s not worth going to see.’ The great cathedrals of Europe are definitely worth going to see. And these massive symbol-filled constructions are not the preserve of Christendom. The Pyramids of Egypt, especially the Great Pyramid of Giza, were similarly built by craftsmen who were sages and who wanted not just to provide the world with beautiful and serviceable edifices, but to leave to posterity an account in stone of their knowledge and their wisdom. Stonehenge and Newgrange – both of which predate the Christian era by millennia – belong in this category. The Jewish scriptures contain a great deal about building, but these passages are often overlooked, and in some copies of the Bible they are printed in almost minuscule letters, as if to suggest that they are of little consequence. There are the instructions given to Moses for the construction of the Tabernacle in the wilderness, and the even more detailed instructions given for the building of Solomon’s Temple. This massive edifice, which was said to stand on the Dome of the Rock is Jerusalem, was destroyed, according to legend by the Babylonians in 586 BCE, but scholars have been questioning for over a hundred years whether any such building ever existed. If it did not – and even if it did – why waste valuable ink and parchment recording the numerous details of its construction – the height of the walls, the position of the altar, the colours of the curtains, the size, shape, and materials of the vessels? It is a question which has perplexed scholars and casual readers of the Bible for centuries. But, as I’ve said so often, the Jews have always believed that the Bible can be interpreted on a number of levels, and even passages like this, which seem to be straightforward descriptions of physical, tangible structures, can have metaphorical, symbolic and spiritual depths. This is certainly the position of certain strands of mystical Freemasonry which teach that the Temple under construction is not the historical temple in Jerusalem, but the Temple of the Spirit, which all of us are called upon to build from the materials of our individual lives. Freemasonry claims a long history, its antecedents going back, in imagination at least, to the builders of the Pyramids and the builders of Solomon’s Temple. It has always been anathematized by the Catholic Church, ostensibly because it is a secret brotherhood owing no allegiance to the Roman pope. But it is also possible that Rome is suspicious of Freemasonry because Freemasonry transmits mystical teachings which undermine the orthodoxies of Catholicism. Did Jesus, or to be more precise, did the writers of the Gospels have access to such teachings, and did they incorporate them into their work? I think they did, and my book on the zodiacal structure of Mark is an attempt to show how these teachings are hidden just below the surface of what appears to be a quasi historical text. But Mark’s Gospel also presents Jesus in a way which Freemasons would recognise. A Freemason refers to himself as ‘the son of a widow’; (apparently, this is one of the secret passwords of Freemasonry). This is the Jesus we meet in Mark. There is no mention of Joseph in the Gospel of Mark, no mention even that Jesus had a father. Earlier I quoted from Matthew’s Gospel in which people ask, ‘isn’t this the tekton’s son?’ but the parallel passage in Mark reads, ‘Isn’t this the tekton?’ Since no father is mentioned, we can legitimately assume that Jesus is the ‘son of a widow’, and so a builder – a tekton – in his own right. Why the ‘son of a widow’? Because a son of a widow traditionally has to make his own way in the world, without the dominating influence of a father. A man inherits his father’s values, his father’s religion, and often his father’s job. He becomes a ‘chip off the old block’ (to use a carpentry metaphor!). But, in the spiritual life this will not do. Each one has to make his or her own way. Each of us has to become, figuratively speaking, the son or daughter of a widow. This is speculative, and I don’t want to make too much of it: on one level, it makes not a jot of difference to my life or to yours whether Jesus was a carpenter or a builder. However, I think there is an important lesson for us in all this, whether or not the details are all correct. Taken together, all these metaphors and symbols give us an image of the spiritual life upon which we Unitarians could profitably ponder. We are used to seeing the spiritual life as a ‘journey’, as a movement from one place to another. And, indeed, we are travellers. But ‘travelling’ should not mean aimless drifting. As the Israelites travelled through the wilderness, they carried their temple with them. They built it while they were on the move, and the very fact that they were ordered to construct it from gold and silver, from the finest wood and the finest cloth, shows that it is not a historical account. Where on earth would they get such things? The text says that they asked the Egyptians for precious things before they left; hardly convincing, and inserted no doubt to make the story plausible to the literalists. We are engaged on the same task. We have work to do on our journey, work on ourselves, work of shaping, polishing, refining, beautifying, fortifying – ‘building work’, in fact. Each of us is – or should be – a tekton, just like Jesus, using the very best spiritual materials of all – courage, steadfastness, integrity, openness, self awareness, service to others - in order to construct a temple fit for the indwelling spirit of God. Marlin, B., (1989) From East to West: Awakening to a Spiritual Search. Fount Paperbacks, London. Page 100. Darlison, B., (2007), The Gospel and the Zodiac: The Secret Truth about Jesus. Duckworth, London. Bill Darlison is originally from Yorkshire, but was Senior Minister of Dublin Unitarian Church before retiring in 2010. Originally a Roman Catholic, he studied for the priesthood in Rome in the early seventies, but left before ordination, marrying Morag in 1975. Finding it increasingly difficult to accept Catholic dogmatism, and attracted by the freedom of thought encouraged by Unitarianism, he became a Unitarian in 1988 and a minister in 1994. He has degrees in English and Religious Studies, and was a teacher for twenty years before entering the ministry. His primary academic interest is in the influence of esoteric and mystical ideas on the development of early Christianity. He is the author of a number of books, including The Gospel and the Zodiac: The Secret Truth about Jesus; and The Shortest Distance: 101 Stories from the World’s Spiritual Traditions. He was President of the General Assembly of Unitarian and Free Christian Churches 2013-14.